So, I have this bad habit. I’ll call it maxim-izing, for now, but it’s far worse than the business cliche’ you may expect. When I see the same issue arise over and over again, I ruminate over it, at some point identify the cause, and then eventually distil the solution into some pithy phrase. They don’t always make sense, but they’re often memorable and have a clear rule. One of my bosses was famous for this. He always wanted to make sure that contracts were signed and in writing, and he would say, “verbal rhymes with gerbil.” No, it didn’t make sense other than everyone on the team knew that they were in trouble for making an unenforceable, verbal agreement. You don’t name a pig that you’re going to eat. Meaning that you don’t haphazardly name concepts or products, or they will forever be known by that name. Communication is about being understood, period. I’ve written about this before. Communication is ultimately meant to change behavior, belief, or drive action. The job of communication is not about speaking; it is about being understood. 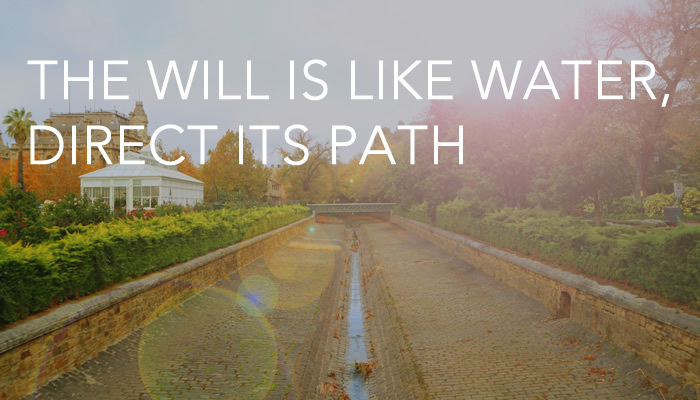 Will is like water. This is the newbie. Basically, the change agent or communicator has to understand that the will of others follows the same rule of water; it will take the path of least resistance. See, water doesn’t care. Try as hard as you want to will water to move, and it will just sit there. Scream at it, kicks it, gently encourage it, nothing. Whether pumped to the highest peak and stored in a water tower or trickled down into the lowest crevices in the earth’s caverns, water has one rule: follow the path of least resistance. Remember Newton’s first law: “that an object will remain at rest or in uniform motion in a straight line unless acted upon by an external force,” that’s the rule of water. Hydrology AND physics, I know, you’re in for a treat! If you want to create lasting change, I believe the best way to influence that change is paving the way. Using gravity, water can be directed into a path. In some cases, the drops and turns can create a force strong enough to climb a hill. Similarly, look around the office, people largely do what they want to do, a majority of the time. We find a way to do what we want to do. The role of the influencer is to direct the path to the desired end—remember begin with the end in mind. Then pave the path with stones answering the question “what’s in it for me?” This is the dark little secret behind finding people’s highest and best use—a principle that shapes my leadership style. When you identify the benefit and the reward, you more easily shape their behavior. Pushing, pumping, yelling, and constant nurturing all fall short of unleashing someone to accomplish what they (and you) want to be accomplished. Special thanks to Matty Sievers for use of the image.